Ho Chi Minh City, often referred to as Saigon, is the largest city of Vietnam and therefore the first point of contact with this country for many travelers. 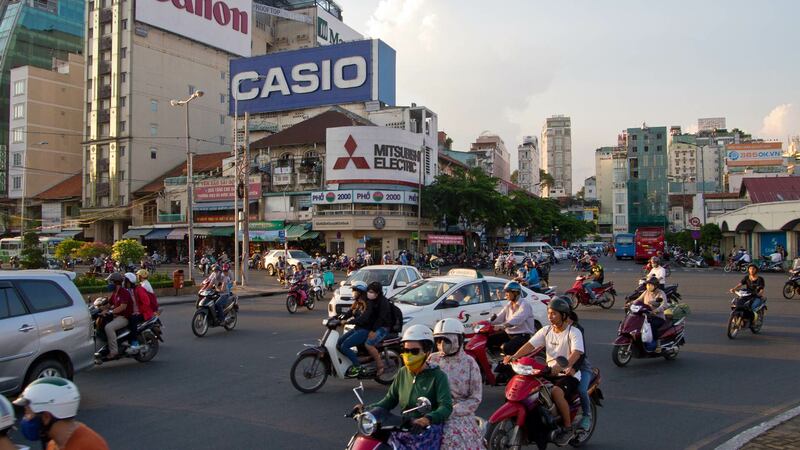 Ho Chi Minh City is chaotic, noisy, hot and just a bit crazy. 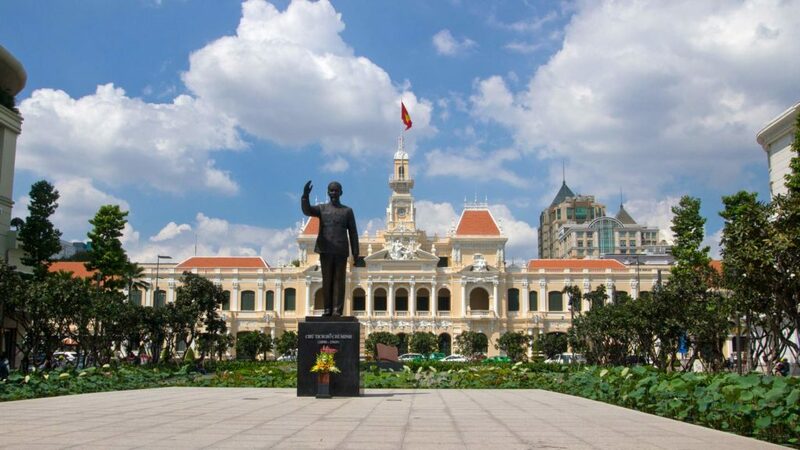 If you are for the first time in Ho Chi Minh City, it is most probably overwhelming and you will need some tips on things to do in Ho Chi Minh City or for some activities around the city. Saigon is huge and the sights are spread all over the city and its districts. In the following article we will tell you which things to do and what to see in Ho Chi Minh City in detail. With these tips your stay in the city couldn’t be more exciting. 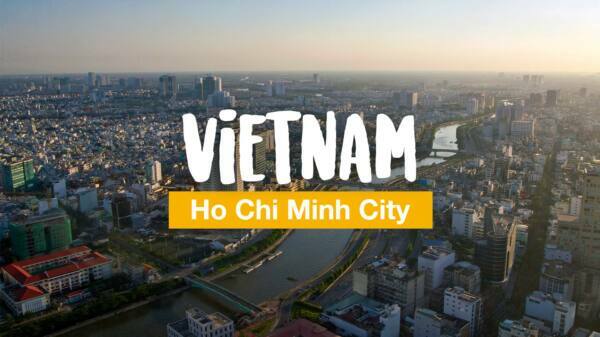 You can reach Vietnam’s largest city in many ways. If you are arriving from outside Vietnam, then the airplane is best. Not only from Southeast Asia, but also from the United Arab Emirates, Hong Kong or Istanbul you can reach Ho Chi Minh City directly. 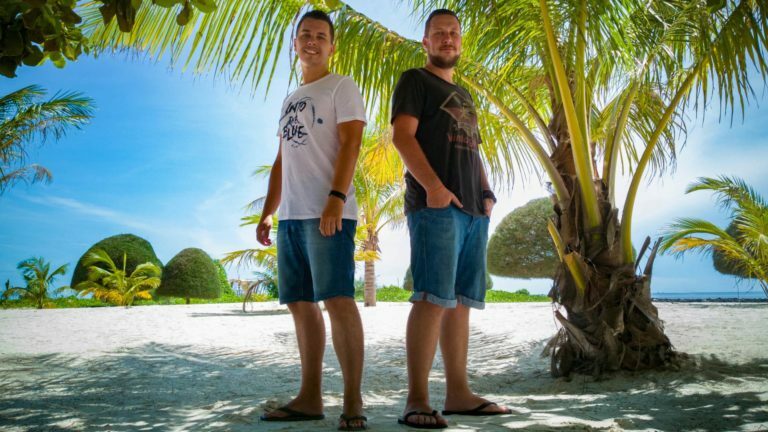 For an overview of flights and ticket prices, we recommend Skyscanner. 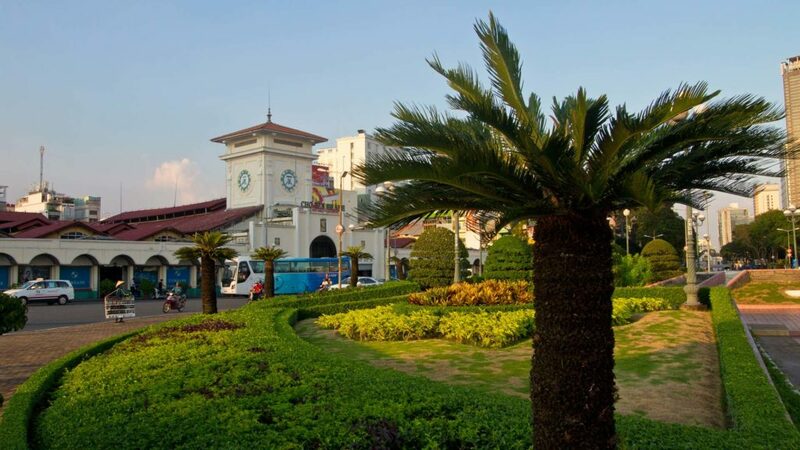 Within Vietnam, there are other popular travel options such as the bus or train, because Vietnam has a relatively well-developed route network. 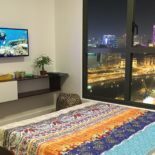 If you’re looking to travel to Ho Chi Minh City, then look on 12go.asia for bus or train connections. A good location is in our opinion the most important thing when exploring a big city. In Ho Chi Minh City, of course, District 1 is best. This beautiful boutique hotel is our recommendation: Anpha Boutique Hotel. The location could hardly be any better. 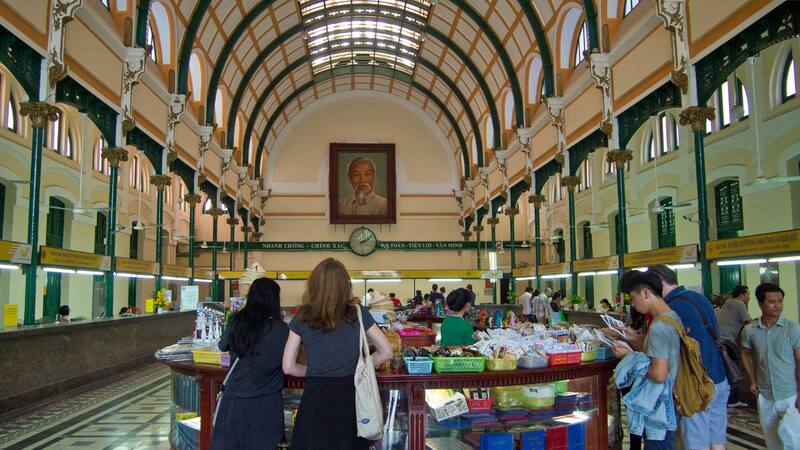 The Ben Thanh Market is just a few minutes walk away, hence it’s absolutely in the city center. Despite the central location, it’s still relatively quiet in the hotel. The rather small but elegant rooms offer everything you need. From the rooftop terrace there is a great view of the city skyline. More hotels in Ho Chi Minh City can be booked here. 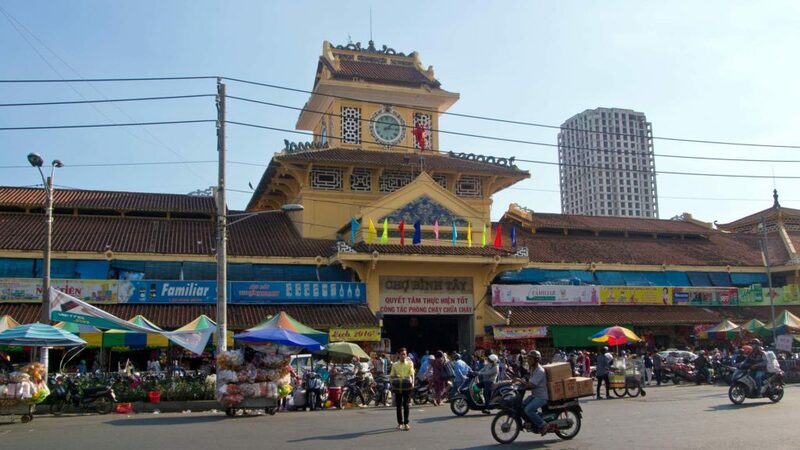 The Ben Thanh Market is one of the famous landmarks of Ho Chi Minh City. Every day thousands of visitors come to the market to stroll around and buy something. You can almost buy everything over here. Clothes, jewelry, souvenirs, food or the popular Vietnamese coffee. Don’t forget to bargain about the prices! Inside the Ben Thanh Market there is always something going on. You can also try some Vietnamese delicacies, which is totally recommended. When the shops at the Ben Thanh Market close about 6.00 P.M., various stalls are set up outside for the daily night market. It is definitely worthwhile to walk around the night market, but not before 7.00 – 7.30 P.M. 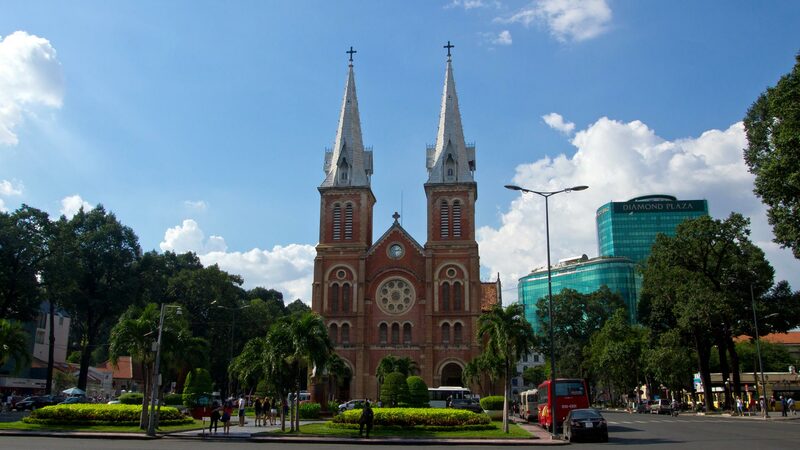 If you would like to visit the Ben Thanh Market with a tour, you can take a half-day trip around Ho Chi Minh City including a visit at the War Remnants Museum and Notre Dame Cathedral. Not too far from the Ben Thanh Market you can find the Bitexco Financial Tower, where the amazing Saigon Skydeck is located. It is on the 49th floor and has a great 360-degrees view at Ho Chi Minh City. We totally love viewpoints and if you do so too, don’t miss that one. Currently the price for a ticket is VND 200,000, which is about € 8. If you can refrain from visiting the Skydeck, you can still check out the cafe or bar in the floors 50 to 52. There you won’t have to pay an admission but still have to order something like a drink. Furthermore, you can also buy tickets in advance online where you can skip the queue during busy times at the Saigon Skydeck. 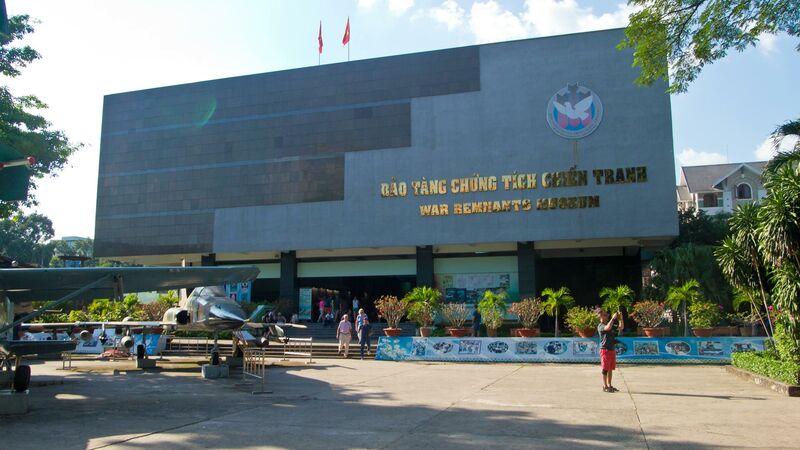 The War Remnants Museum shows the wars in which Vietnam was involved in the recent past. Special attention is given to the war with the Americans, where also weapons of mass destruction like napalm were used. For those who are interested in this subject, it is definitely worth a visit. Furthermore, you can see several vehicles like tanks or jets in front of the building, which were used during the war. The museum is open daily from 7.30 A.M. to 11.30 A.M. and from 1.20 P.M. to 4.30 P.M. The admission is VND 15,000 (€ 0,60) per person. The tunnels were used by the Vietcong during the war to hide. There were even schools and offices under the earth. Today you can visit a 90 meters long tunnel section in memory of the war and see for yourself how it must have been back in the days. A day trip to the Cu Chi tunnels from Ho Chi Minh City usually starts at USD 4-5 plus an admission of VND 90,000 for tunnels. You should have a look at several agencies before you book the trip to compare prices. 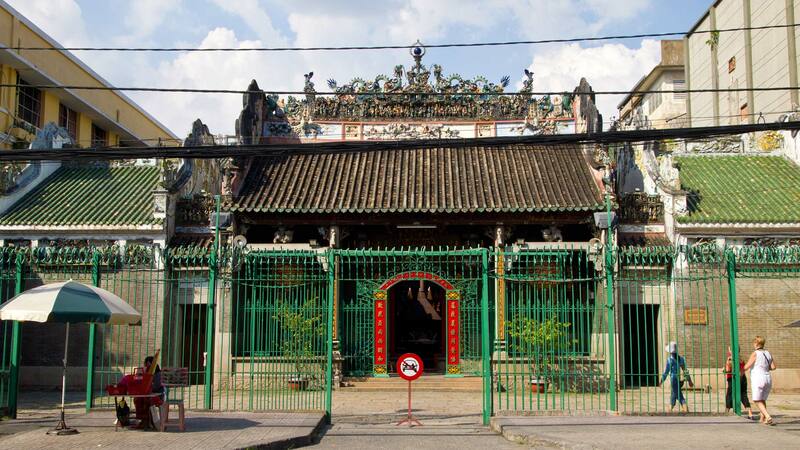 The Jade Emperor Pagoda is one of the most important Taoist temples of Ho Chi Minh City. In the temple you will find plenty statues of various gods, Buddhist statues and of course some of the eponymous Jade Emperor. Next to the main building is a small basin with many turtles and on the inside you can see lots of different rooms, shrines and altars. Very impressive and despite the high visitor rate the whole temple complex is really quiet and relaxed. The pagoda is open daily from 7.00 A.M. to 6.00 P.M. and there is no admission to pay. Nevertheless, you are always welcome to leave a donation. There is no entrance fee if you want to visit the cathedral, but you have to be aware of the opening times. It is open daily from 8.00 to 11.00 A.M. and from 3.00 to 6.00 P.M. On Sundays there are also regular worship services, which you also can attend to. 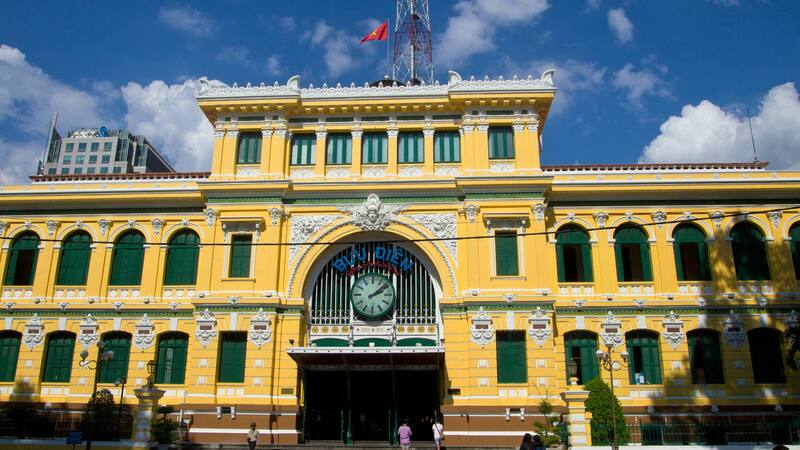 Right opposite the Notre-Dame Cathedral you will find another famous building – the Central Post Office in Ho Chi Minh City. This building is also kept like many others in a French colonial style. The design was made by Gustave Eiffel, who also designed the Eiffel Tower in Paris. The Central Post Office is nowadays a tourist attraction, but still serves the purpose as a real post office and you could send some letters home to your family and friends. The interior is beautifully designed and there are also some souvenir shops for visitors on the inside. During the week the Central Post Office is open daily from 7.00 A.M. to 7.00 P.M. At weekends it will close at 6.00 P.M. Of course there is no admission to visit the building. The Reunification Palace, also known as Independence Palace, is today not only a museum, but there are still meetings and events held by the government. It’s also the place where the end of the Vietnam War was decided. The palace is one of the most visited sights in Ho Chi Minh City. On the inside you can take a look at many rooms with the original furniture like chairs or tables. The basement with some control rooms etc. is also worth seeing. The admission is VND 30,000 per person. 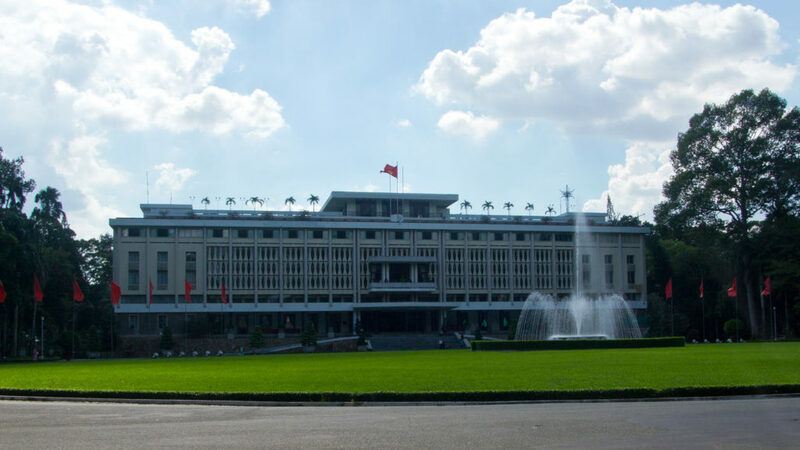 The Reunification Palace is open daily from 7.30 to 11.00 A.M. and from 1.00 to 4.00 P.M.
You can also explore the Reunification Palace in combination with the Notre Dame Cathedral, the War Remnants Museum and Binh Tay Market on a day trip in Ho Chi Minh City. As in many Asian cities like Bangkok or Singapore, you will also find the famous Hindu temple Mariamman in Ho Chi Minh City. On the inside there are many images and statues of Hindu gods. The Mariamman Temple is located close to the Ben Thanh Market. It was built at the end of the 19th century in honor of the Hindu deity of strength – Mariamman. 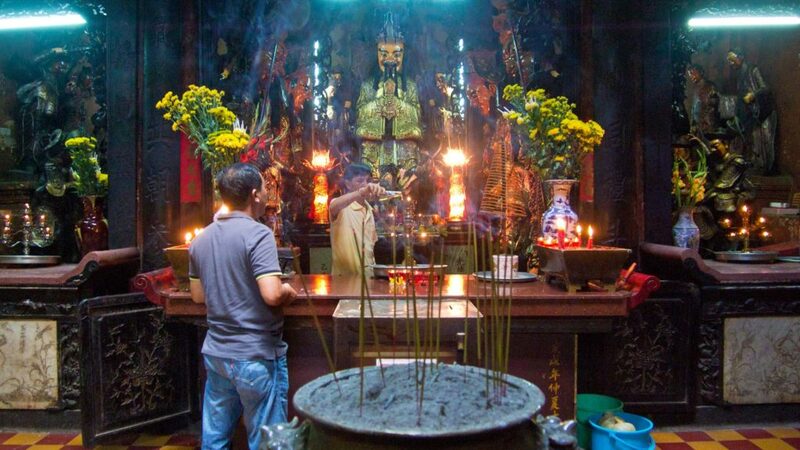 Today it serves the quite small Hindu community of Ho Chi Minh City as a place of worship. 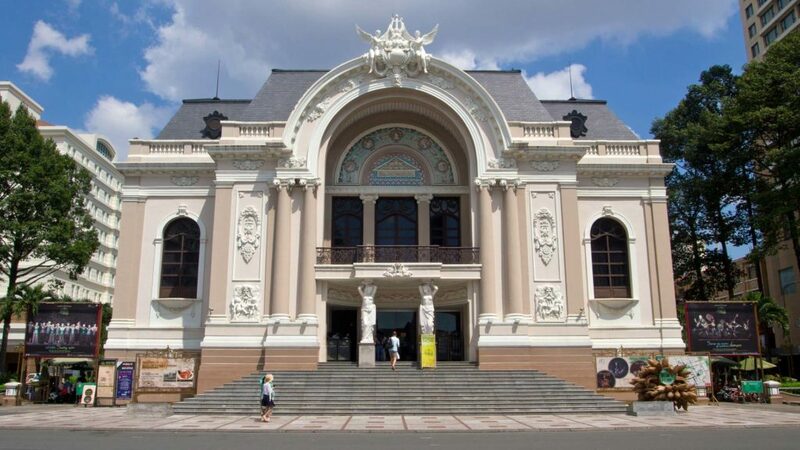 It is open daily from 7.00 A.M. to 7.00 P.M. and free of charge. Located on the famous Dong Khoi Street, you can see the Ho Chi Minh City Opera. This is another French colonial building and very well-preserved. On the inside there are still traditional Vietnamese shows regularly. If you would like to see one, you should definitely not miss the Opera. Prices for a show start at VND 500,000. You can either buy them directly on site or book online beforehand. 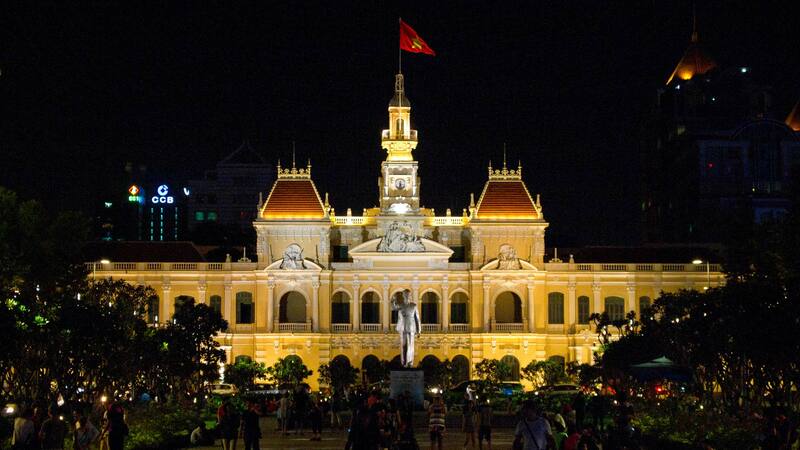 Another magnificent building in French colonial style is the former Ho Chi Minh City Hall. The impressive hall was built in 1906 and is today the place of business for the Vietnamese People’s Committee. In front there is a statue of Ho Chi Minh and a huge square, which leads down to the river. However, during the day you won’t find lots of shady spots on the square and therefore it is pretty empty. But as soon as the sun sets, the square comes to life – just like the rest of the city. In addition to some vendors and many visitors in the evening, there are also lots of students who like to chat with some tourists to improve their English. And also, the former city hall is colorfully illuminated and a popular spot for some great nocturnal pictures. 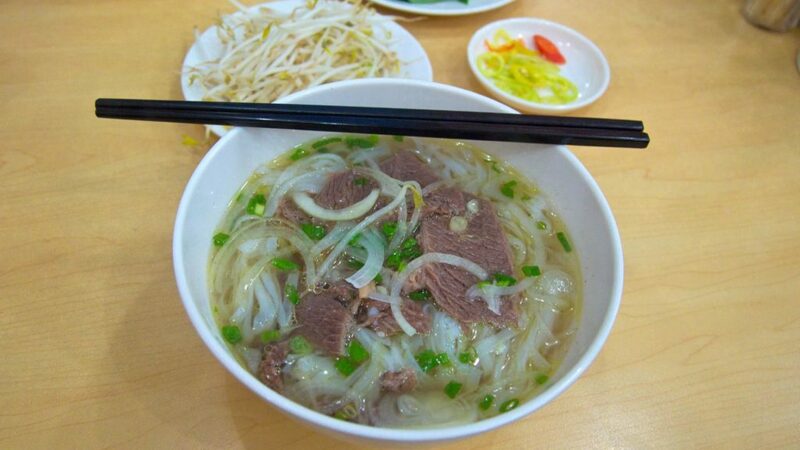 Vietnamese food with its diverse cuisine is well-known beyond the country. There is everything from rice dishes to sandwiches or noodle soups. You should absolutely try the Vietnamese soup Pho and our favorite Vietnamese dish, the Banh Mi sandwich. 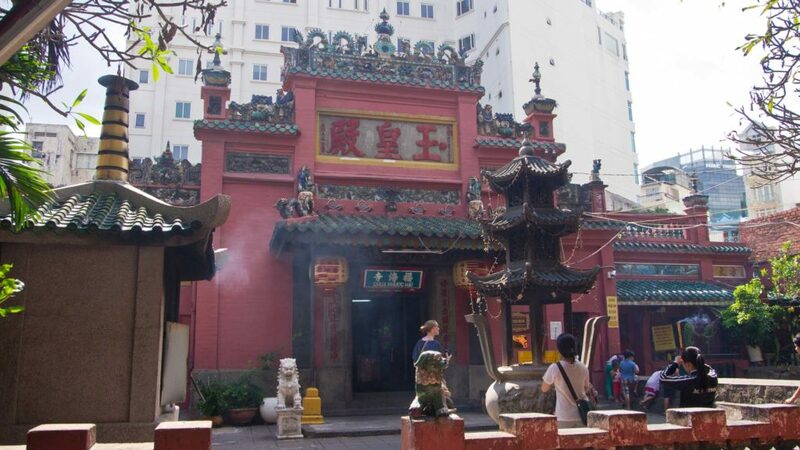 The Thien Hau Temple is located in Ho Chi Minh’s Chinatown. The Vietnamese name is: Chùa Bà Thiên Hậu. The temple is dedicated to Thien Hau, the protector of the sailors. Even if the temple isn’t really impressive from the outside, it is still known as one of the highlights of Ho Chi Minh City. 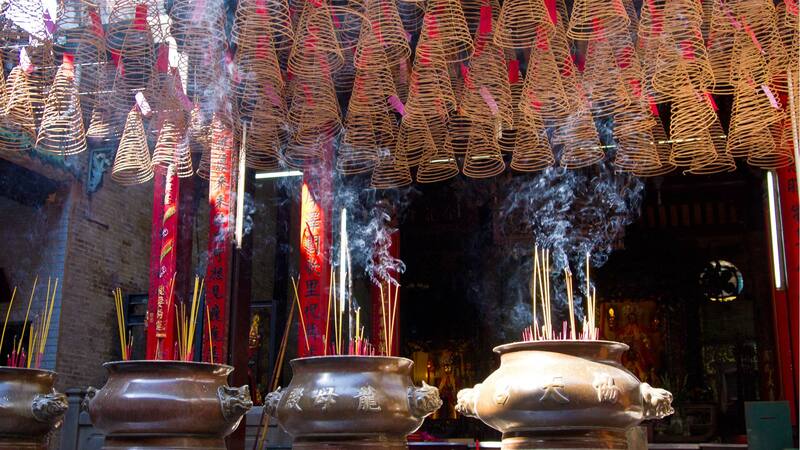 As soon as you get to the inside, you will notice the smell of the incense sticks that are scattered throughout the temple and hanging from the ceiling. A really imposing temple which is definitely worth a visit. 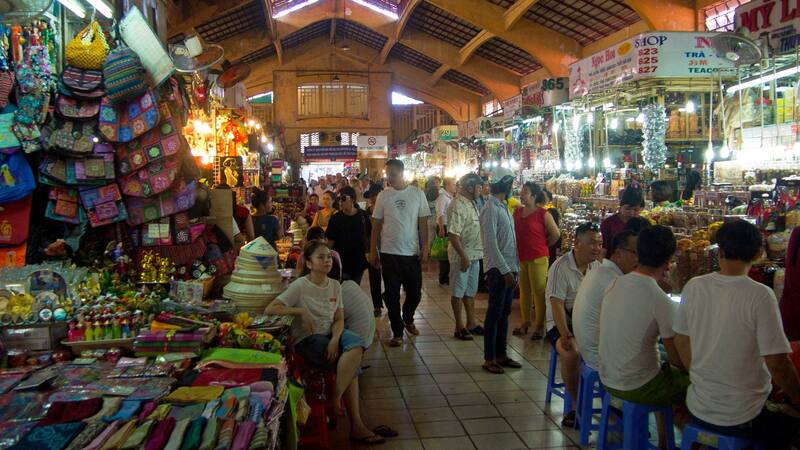 The Binh Tay Market is also located in Chinatown and similar to the Ben Thanh Market, but much less touristy. You will not only notice this with the prices, but also because most of the visitors are locals at this very market. At the market you will find all sorts of goods from food to clothing. The market as well as its side streets are a real great experience. There are countless people walking around and in spite of all those people, there are still motorbikes squeezing through the side streets of the market. The pure chaos, but quite worth seeing. 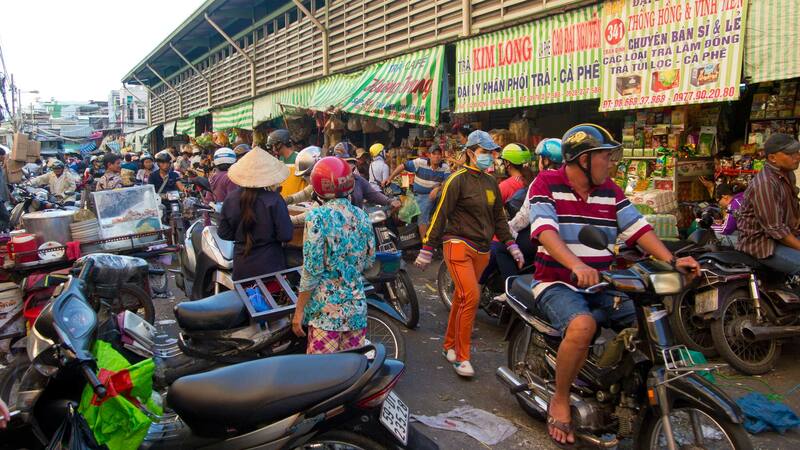 If you are heading to Chinatown in Ho Chi Minh City, be sure not to miss the Binh Tay Market. The Turtle Lake is a huge roundabout in the center of Ho Chi Minh City and especially popular in the evening among locals. 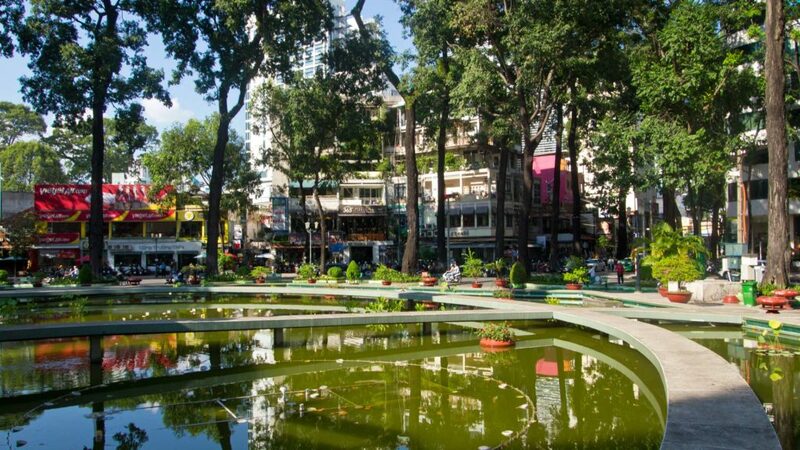 Here you will find countless street stalls with delicious Vietnamese food and the locals (mostly the younger ones) meet at the Turtle Lake to eat, chat, play games and more. 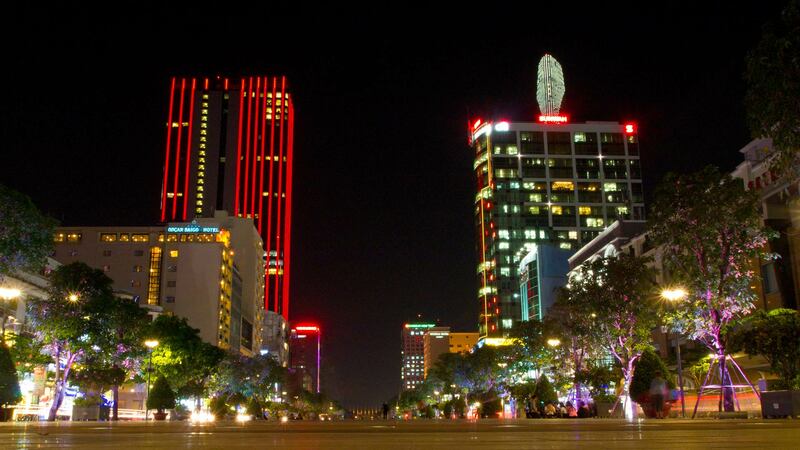 The Starlight Bridge is located in a more upscale part of Saigon called Phú Mỹ Hung. 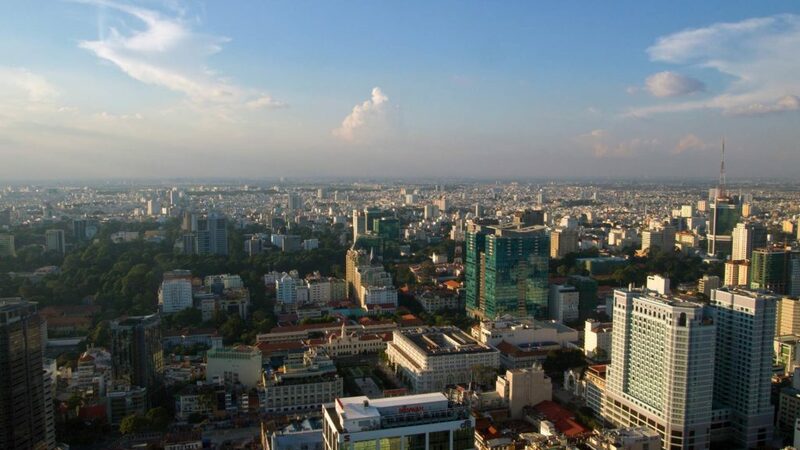 The cityscape over here is quite different and you will find lots of exclusive restaurants and huge shopping malls in this area of Ho Chi Minh City. However, the Starlight Bridge, which leads across a lake and has a small waterfall installed, is a special highlight. In the evening it is illuminated in rainbow colors and offers a great play of colors on the water of the lake. 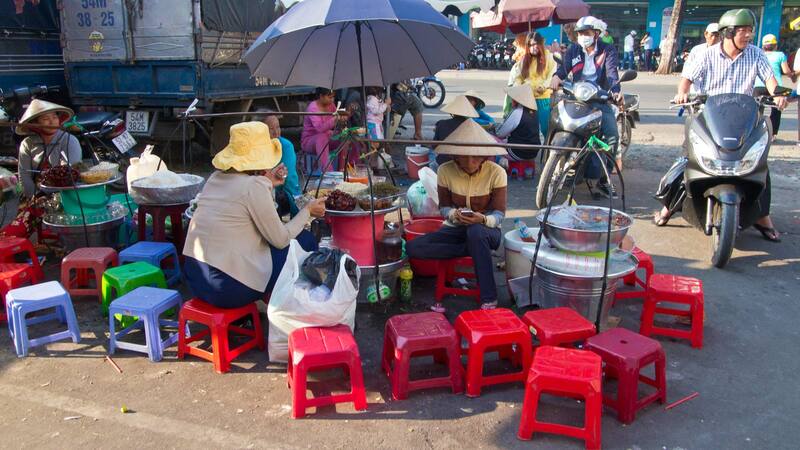 During your stay in Ho Chi Minh City you will see lots of small chairs at street corners, where people sit down to eat or drink something. However, mostly you will only see locals at those places and not much tourists. Dive into the local culture and join the locals. You will definitely be accepted with a friendly smile. Most of the stalls offer some beer in the evening, which you can enjoy by the roadside. Take a seat, have a drink and absorb the atmosphere of the city. It’s amazing! 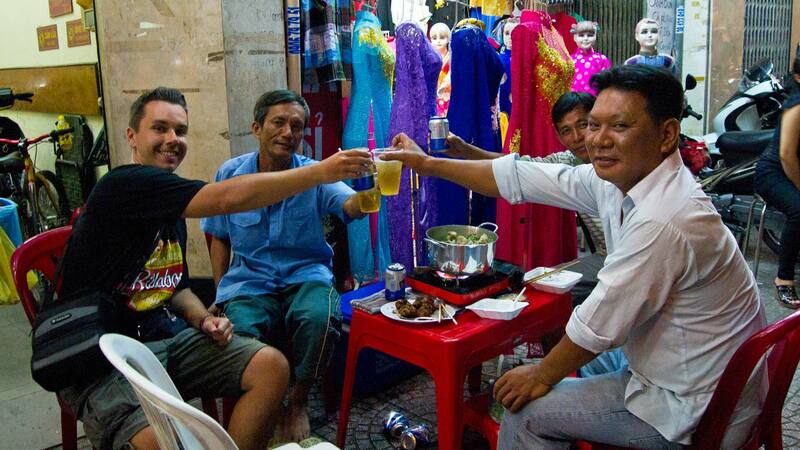 You can also try the local street food in Ho Chi Minh City on an evening street food tour and let yourself be guided through the various dishes. If you are already drinking or eating on the street, you should take some time to watch the chaotic traffic. It is absolutely amazing. The hectic hustle and bustle on the streets looks like there are no rules at all and one scooter would crash inside the next in just a second. But somehow everything has its order and strangely, it works. Even in the nighttime the traffic is a massive spectacle and worth seeing. In many travel agencies of Ho Chi Minh City you can also book a tour to the Mekong Delta. These day trips start in Saigon in the early morning and will take you by bus to the Mekong Delta. From there you will go on by boat. On the way you will pass local villages, beautiful scenery, mangroves and many other highlights while experiencing the idyllic life of the Mekong Delta. A great report on a tour through the Mekong Delta you can find on Bruised Passports. 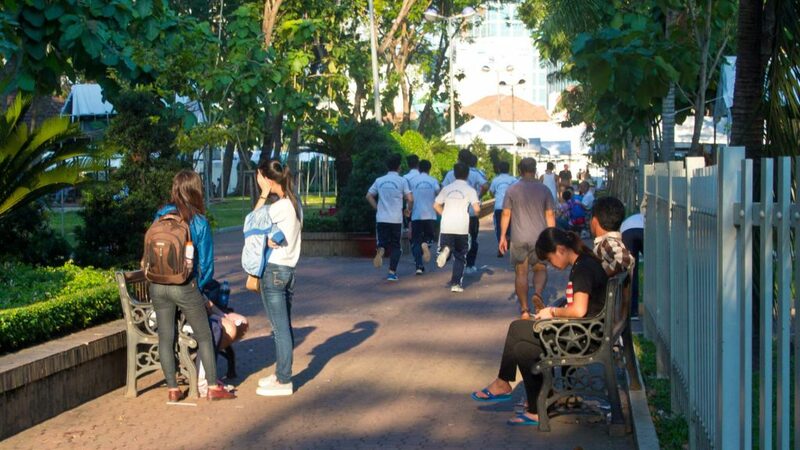 Like mentioned before, at the Ho Chi Minh City Hall, you can also meet many students at the September 23 Park next to the Ben Thanh Market. They go here to talk to tourists and to improve their English skills after university. So if you stroll around the park in the late afternoon, don’t be surprised if some Vietnamese students approach you and ask something about your origin. It’s also a great way for you to learn something about their culture and make some contact to locals. 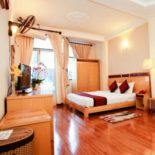 In Ho Chi Minh City you’ll find a range of hotels – from simple low budget hotels to stunning luxury accommodations with a view at the skyline of the city. If you are looking for a place to stay, we have listed a few recommended accommodations in the following. 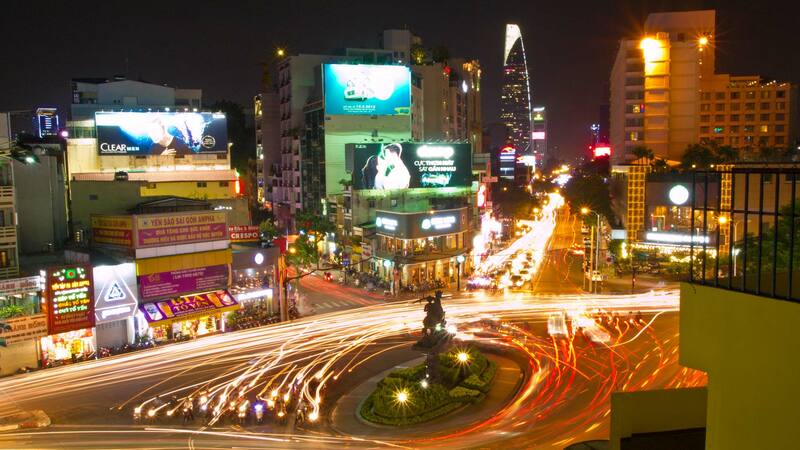 Have you ever been to Ho Chi Minh City? 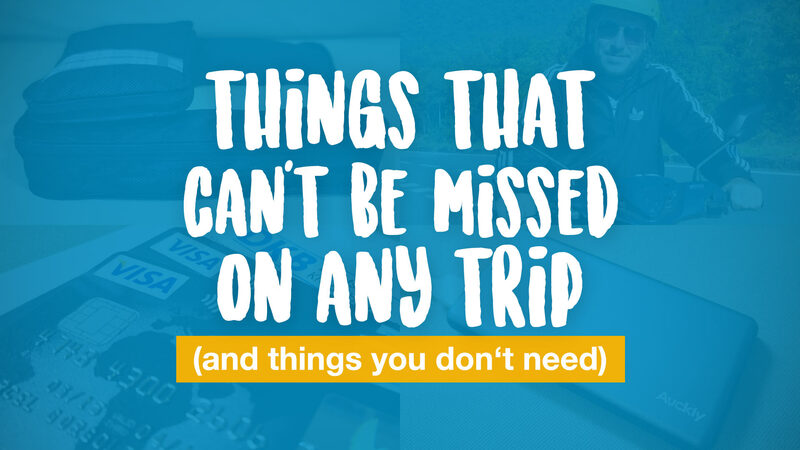 Is any important sight missing on our list? Leave us a comment below! For me, the most interesting place in Ho Chi Minh City is the Museum of War Remnants. The photos are drastic but it’s worth seeing them. Nice tips. I’m heading there in a couple of weeks and half looking forward to it (first time trip) and half dreading the crowds and chaos. I like the idea of heading out on day trips to the tunnels and delta. Either way, you make it look so interesting, I think I’m excited again. Interesting to see the French colonial architecture influence. I think I’ll definitely try the sky deck, thanks for the tips!